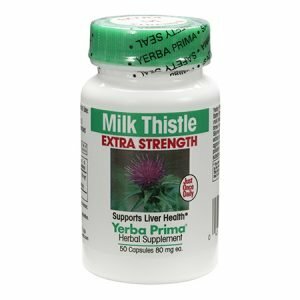 BENEFITS: Yerba Prima Milk Thistle Extra Strength is four to twenty times stronger and more bioavailable than regular Silymarin milk thistle seed extract. It contains clinically proven milk thistle seed extract plus the assimilation boosting nutrient Bioperine® black pepper extract. Maximum Absorption: Milk Thistle Extra Strength provides maximum absorption. Our Extra Strength formulas are made with standardized herbal extracts, which are assimilated more completely than common powdered herbs. Bioavailability of our Extra Strength herbs is further boosted by the addition of a patented black pepper extract, Bioperine®. As part of our Extra Strength formulas, it actually increases the amount of herb crossing the intestinal lining into the bloodstream. What this means to you is greater absorption, which equals greater benefits. Convenience and Great Value: Our Extra Strength formulas give the convenience of taking one capsule per day for normal use. This makes it easy to use them consistently for their full benefits. Many products that need to be taken several times a day are not used with proper regularity, resulting in a loss of benefits. In addition, our Extra Strength herbs are a great value. A bottle of Extra Strength herbs may last two, or even three times a long as regular strength herbs with only a small increase in price. The greater absorption provided by our Extra Strength formulas adds even more to the value. cellulose, USP Kosher gelatin capsule. Made in U.S.A. © Yerba Prima 2013</div?